Academics have been asking for ways to securely manage question banks to use for tests and exams. 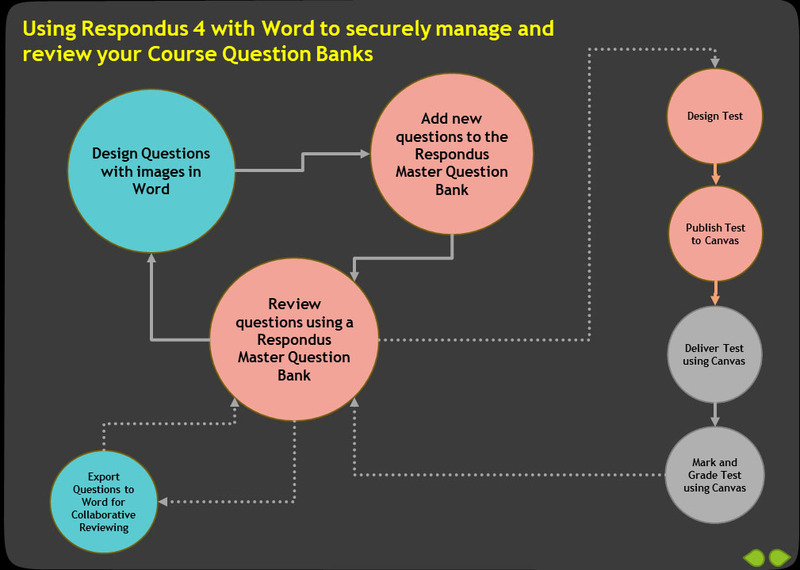 A number of supported tools can make it easier to create, review and organise your questions, including the option to share question banks on the faculty S Drive. Using Respondus 4 and Word with Canvas Quizzes it is possible to follow a Design -> Add -> Review cycle for your questions. The cycle starts with you designing and creating your questions in Word. These questions can be multiple choice, essay style or a number of other formats. In this design process your multiple choice questions can include images in questions and in responses. The diagram shows this step titled Design Questions with Images in Word. Before importing your questions into Respondus the Word document must be laid out in the correct Respondus import format. There are templates, videos and support resources on how to do this in the MyUni Learning Centre. After importing to Respondus, each question has a title with up to 60 characters. Thus, it could contain detailed metadata such as the topic, the difficulty, when it was used, who used it and so on. When formatted correctly, hundreds of questions can be imported into Respondus from Word in just a few minutes. After importing to Respondus you can copy questions into your Master Question Bank. See Section E of this Interactive Respondus Presentation to see how to do this. Searching through hundreds of questions in your Respondus Master Question Bank is made easy using the Respondus Search tool. This is one of two possible ways to find and review your questions. Another way to review your questions is to export them to a single Word document that makes it easier to work through using standard document review techniques. Section I in the Interactive Respondus Presentation shows how to do this in more detail. After reviewing and editing you can reformat in Word so they can be re-imported into Respondus. Co-ownership of Respondus Question Banks is made possible by setting them up in a shared faculty folder. For further details on how this is done see this see Sections A and B in the Interactive Respondus Presentation. Section F and G of this interactive presentation shows you how to import and export questions from Canvas to Respondus in QTI format. Using this Question Bank Management system should make it easier for you to design, publish and deliver tests and quizzes. For further information on this topic, view the Respondus pages in the MyUni Learning Centre. This entry was posted in News, Support, Teaching and Learning and tagged exams, question banks, quizzes, Respondus. Bookmark the permalink.